Gosh this weather is something else !! We are just not used to it are we ? 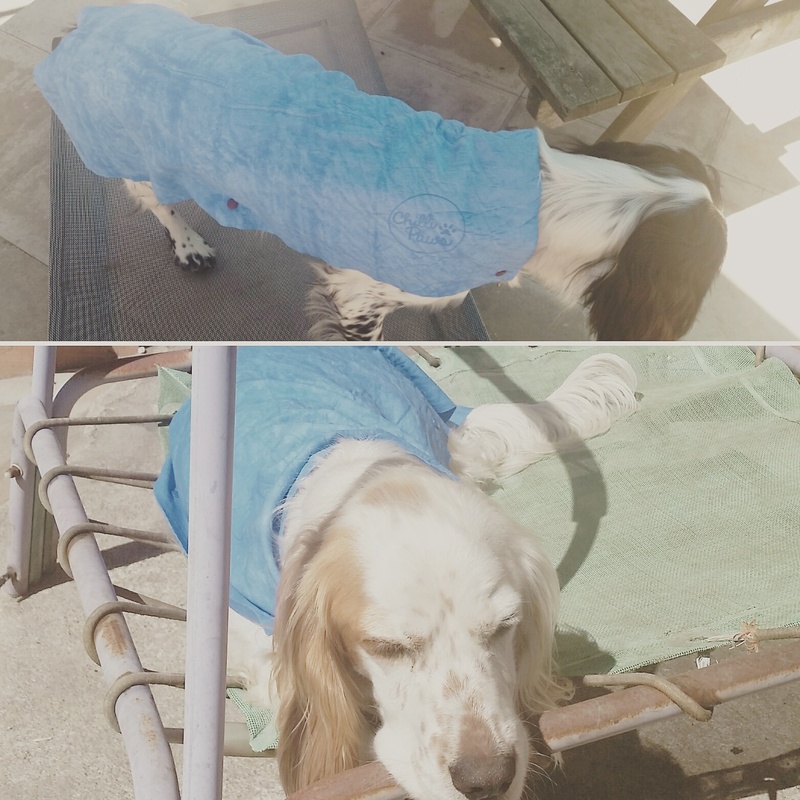 The towels / coats are placed in cold water with the excess squeezed out and placed on the dogs back , water easily evaporates which results in a drop in temperature to keep the dogs cool. Dogs fur coats don’t allow for body heat to leave their body, causing them to warm up. Dogs also don’t have many sweat glands, where we begin to sweat at the smallest rise in temperature, dogs cannot. A dog’s biggest weapon against the rising heat is their ability to pant. Dangling their long tongues out of their mouths and breathing rapidly. This lets the warm blood inside the tongue meet the somewhat cooler air and lets the dog cool down. While panting does work for dogs, sometimes they need help from their owners. Remember that some dogs are also more prone to heat damage than others, older dogs, dogs with longer fur or even dogs with respiratory problems should be given extra care when it begins to get hot. For the most part, there are a few simple signs we can take notice of that will let us know that our dogs are feeling hot, these signs are key to pet owners recognising If and when to take action to cool the dog down. Excessive panting or even panting in general is a good indicator that your dog wouldn’t mind feeling a bit cooler. Panting with excessive, thick drooling also shows that your dog is getting a bit warm. If you notice your dog acting slow to react or seeming lethargic, this can be a sign of excessive overheating and you should take action immediately. If you notice any of these signs, or even if you just wish to prevent them in the first place, there are a few things you can do. Keeping a fresh supply of cool drinking water handy and available to your pet at any time is a great start. Having plenty to drink will keep them hydrated and the cool water moving through their body will help keep the temperature down. Always making sure they have a cool, shaded and well ventilated area to lay or rest is also a great way to help, being surrounded by cool air from a fan or a breezy open window will cool your dog’s skin down and can trap cool air in their fur, helping them stay cooler for longer. For more immediate help, placing your pet in cool water, maybe from a bath or paddling pool can provide immediate relief to a hot pet, just be careful to keep their head above water and make sure they’re comfortable. If your pet doesn’t like being submerged, a cool wet sponge dripped or padded on their head and tummy can help them cool down too. You can even take to spraying them with a slow water hose if they don’t mind. Also, covering your dog with a cool, wet towel is a quick and easy way to cool them, although it could quickly turn into a game of chase the wet dog. If your dog becomes slow to react or they seem to have lost the ability to co-ordinate their legs, you should take action straight away with any of these tips but prevention is always better. Making sure your dog has access to cool areas and cool water is the best way to stop your dog becoming too hot in the first place. Avoiding long strenuous exercise on hot days is advised too. Dogs are naturally very playful and often will keep playing long after they’re too hot. If you notice your dog not responding to any of these tips or they become non-responsive, you should visit your vet immediately. But with the proper care, you and your dog can enjoy the summer together. Next postWhy Pre- Agility ?? ?